This is the time, when all our bonsai are sleeping the winter away, that we can continue our hobby with tropical plants. 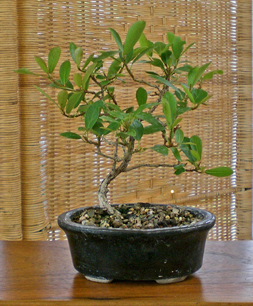 In previous columns, I listed some of the plants that were commonly used for bonsai indoors. If you haven’t as yet tried them, why not this year? To entice you, the club will be raffling a Ficus bonsai at each meeting in January and February. The care of bonsai indoors during the winter months requires a close watch on moisture and light. Most indoor plants will thrive on a light reading of 500 lux. If your home is dry, some means of providing humidity may be necessary. I use humidity trays and occasionally misting. As growth slows during this time, fertilizing should be reduced to once a month. Keep an eye out for pests. Most indoor plants seem to attract whiteflies. I use an insecticidal soap to control them. Do not neglect your indoor trees during the holiday season. Season’s Greetings!